Cropped image of Diana descending from Pericles, Prince of Tyre. 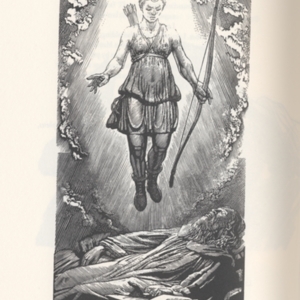 An image of Simon Brett's engraving featuring Diana descending upon a slumbering Pericles. The paper is Zerkal paper. Cropped right portrait of Pericles from Pericles, Prince of Tyre. 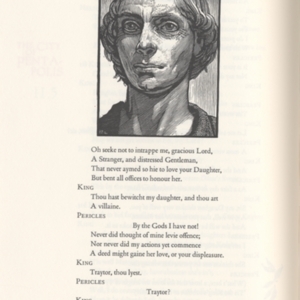 A cropped image of a two page spread, featuring a portrait of Pericles engraved by Simon Brett. The type-setting was performed by Crispin Elsted. The paper is Zerkal paper. 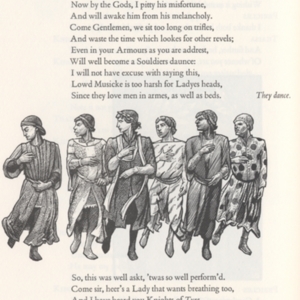 Cropped right page of dance in Pericles, Prince of Tyre. 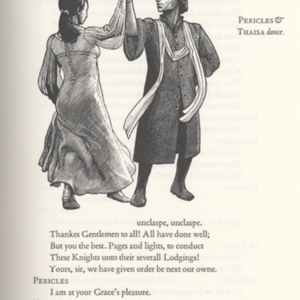 A cropped image of a two page spread, featuring Pericles and Thaïsa dancing. 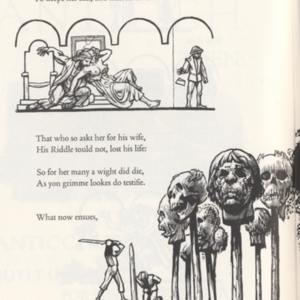 The image is printed from an engraving done by Simon Brett. The type-setting was performed by Crispin Elsted. The paper is Zerkal paper. Cropped left page of dance in Pericles, Prince of Tyre. 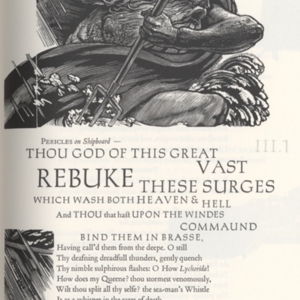 Cropped left page of first storm in Pericles, Prince of Tyre. Cropped comic vignette from Pericles, Prince of Tyre. Close up of left first storm scene Pericles, Prince of Tyre. 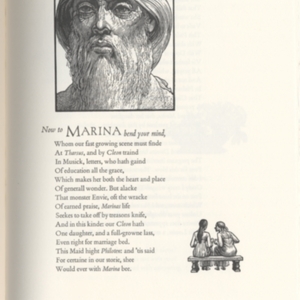 One tall quarto sized piece of Zerkal paper with a portrait of an old Pericles, a column of text printed in Poliphilus and Bando, and a small image of Marina and another woman. 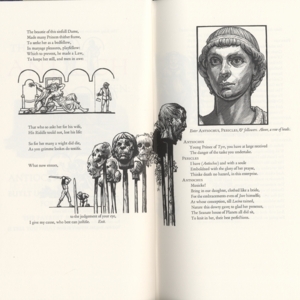 Two tall quarto sized Zerkal pages containing comic vignettes of the riddle scene from Pericles, surrounding text and also a portrati of a young Pericles. The Type-face is Poliphilus and Bando. 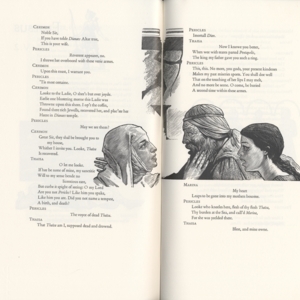 Dual page illustration of Thaïsa and Pericles reunited in Pericles, Prince of Tyre. 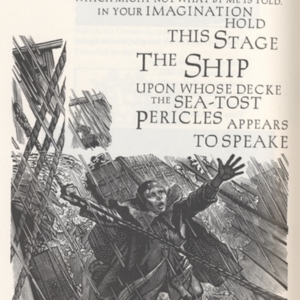 Woodcut imprint of Thaïsa and Pericles reunited from Pericles spanning two tall quarto sized pages of Zerkal paper, surrounding text in Poliphilus and Blado type-face.